Relish in the luxuries and comforts of this 3-bedroom, 2-bath vacation rental house in Litchfield! 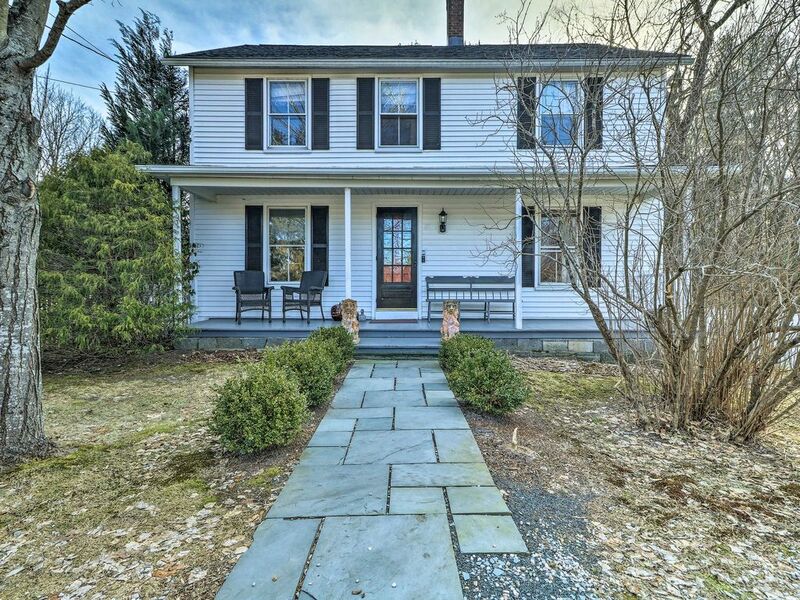 'Stone-Peca' is a quintessential New England property sitting on a half acre of land, offering a 4-season sun porch as well as a spacious backyard with a deck and patio. Stylish, high-end decor adorns the interior, making this home comfortable for families or groups of up to 7 guests traveling together. The home is less than 1 mile to the town center, offering shopping and dining within easy reach! The cozy living room features rustic wood decor met by modern, plush furniture. Relax in front of the flat-screen cable TV during downtime. Open to the kitchen, this area makes it easy for everyone to spend time together. The gourmet kitchen offers granite countertops and stainless steel appliances. Prepare your favorite meals and enjoy them at the breakfast bar. Just off of the kitchen is the all-season porch, which houses a vibrant futon that can provide an additional sleeping option. This room is the perfect place to enjoy a novel or take an afternoon nap. Perhaps one of the best features of this home is the private backyard that’s completely fenced in. With a deck and separate patio that offer comfortable seating options, an outdoor table, umbrellas that provide shade and a premier gas grill. From this home, you’ll be in the perfect location to explore all that the area has to offer. Less than a mile from the center of town, you’ll be able to walk to a variety of shops, restaurants, wine and spirit stores, the public library, and more! For those who are interested in exploring the surrounding nature, make sure to visit White Flower Farm, White Memorial Conservation Center, and Topsmead. Lush gardens, vibrant flowers, and easy walking paths will brighten up your day! Incredibly sweet and charming home! I loved every day and evening of my stay this picture perfect 1800s country home. It’s super cozy yet plenty spacious. Each room has its own special purpose and personality. I wanted to spend time in all of them. I slept so well every night. It’s a very peaceful happy house. Everything was appropriately stocked for convenience in the kitchen and baths. I loved the front porch but it was too cold during my stay to enjoy it. Next time!!! I would definitely go back and I plan too. House is in a wonderful location, walking distance to great dining in Litchfield. Simple, old school charm. Comfortable, and easy. Great property- very well appointed kitchen and dining accessories. The house just makes sense! We enjoyed having our family of 6 plus one infant in this well appointed home. Beds and bedding were comfortable and the houses proximity to the town offerings made walking to area restaurants and shops pleasant. Would defiantly recommend this property and stay again. This listing keeps in the true spirit of home away. I felt like Sharyn shared her home with us and was at the ready or provided contacts if any problems arose, of which we had none. Charming historic home with every accommodation you need. Beautifully decorated. My only issue was that the second bathroom is on the first floor and all bedrooms are on the second floor so it’s a challenge to go downstairs to use the bathroom if you’re sharing the house with other people. Charming home with wonderful yard! We loved staying in this charming home. The furnishings were beautiful, the beds were very comfortable. Everything we needed for our stay was right at our fingertips. I would highly recommend this home!